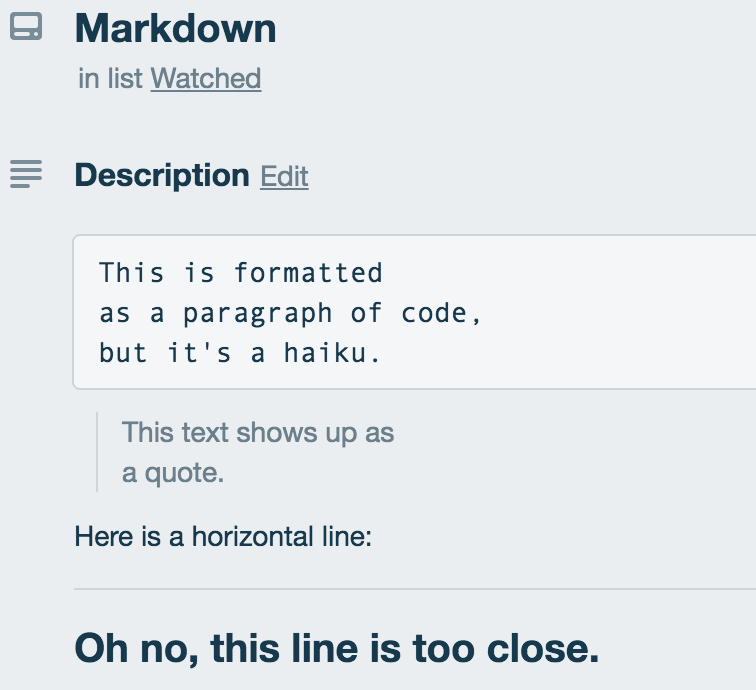 Markdown is a simple language used to add formatting to text. 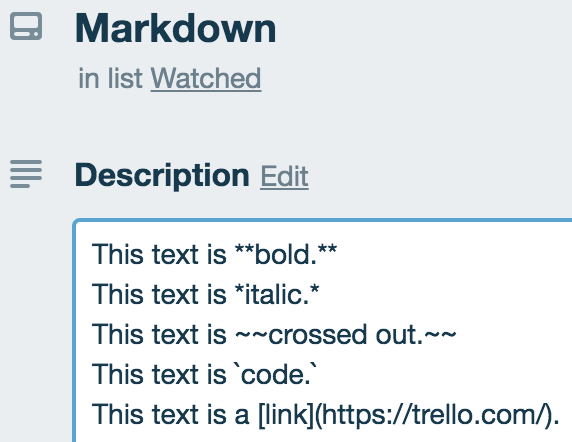 Trello uses a modified version of the Markdown syntax. It allows you to easily add bold, italics, links, lists, paragraphs, headers, and images and code blocks to blocks of texts. 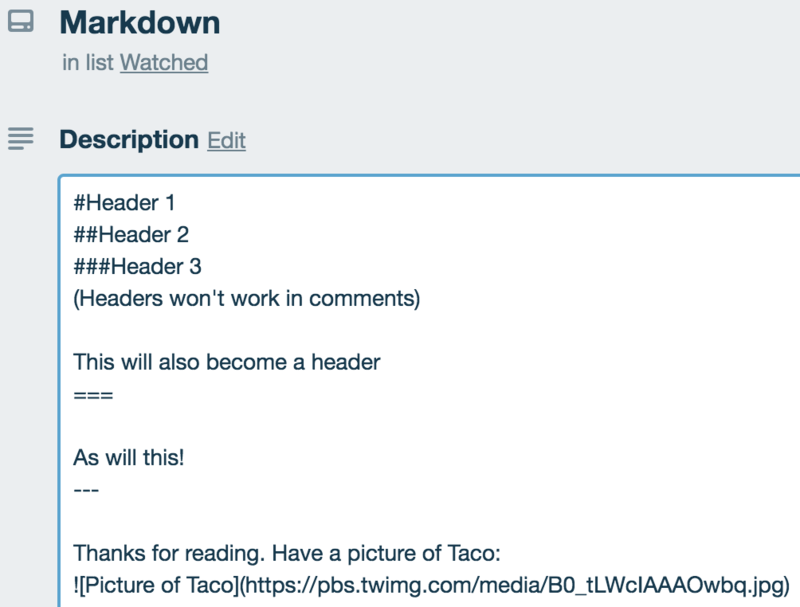 You can add markdown to your cards in the card's description, checklists and comments, as well as in your Trello bio. Markdown does not work in card titles, and not all syntax will display when using the Trello mobile app. Bold text - Mark text in double asterisks, like **this**, to make it bold. Strikethrough text - Cross out text by wrapping it in two tildes on each side, like ~~this~~. Inline code - Include inline formatted code by wrapping it in a single backtick (`) at the beginning and end of the code. Links - Create a link by putting the link text in brackets and the URL in parentheses, like [this](http://www.trello.com). Horizontal line - A line with at least three hyphens will create a horizontal line across the entire description or comment. In card descriptions, include an extra line break after any text before the line of hyphens to prevent the hyphens from being interpreted as header syntax. Code block - Include formatted code by wrapping it in three backticks (```) at the beginning and end of the block, or by starting a line with four spaces. Note that the triple backticks have to be on a separate line and ensure you have a blank line before and after the code block. Indent text / Block Quotes - Indent text by including a “>” in front of each line of the text that you’d like to indent or quote. 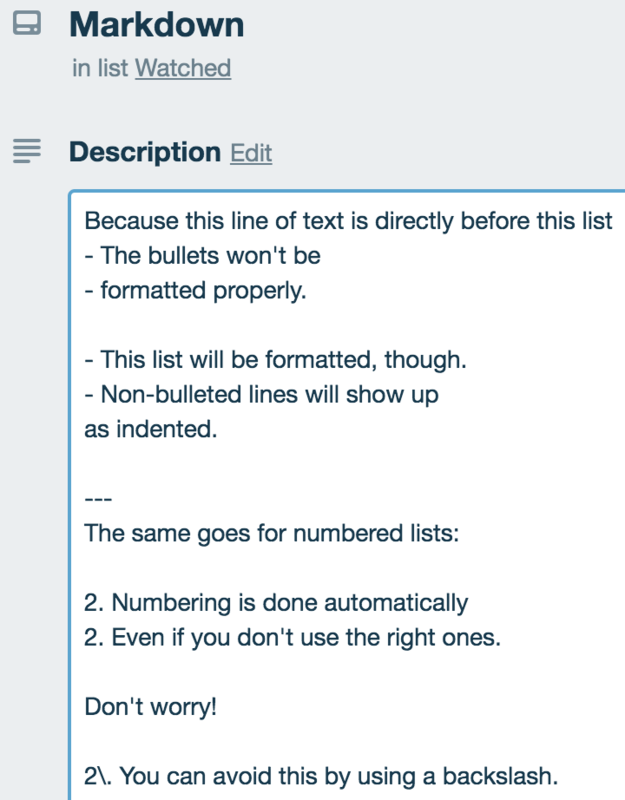 Bullet and numbered lists: Preface a series of lines with hyphens or numbers to create a list. Lists will only be formatted if you start a new paragraph (by leaving a blank line before the list). 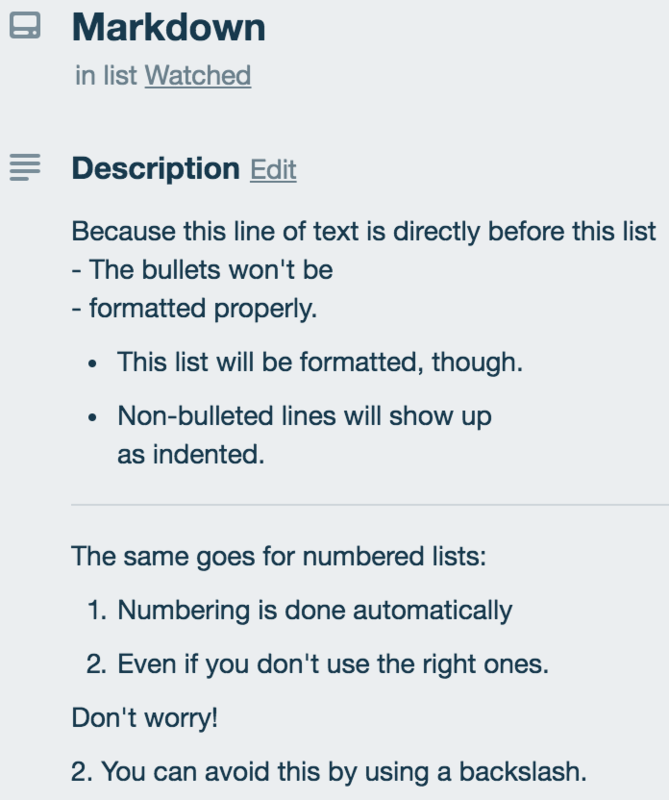 You can add a space before the bullet mark to create nested bullets. To indent within a bulleted or numbered list, start the new line with a space. Any line that begins with a numbered format, even if the number isn't 1, will automatically create an ordered list. This is as expected and per markdown specs. You can preserve your formatting by putting a '\' before the period, e.g. 28\. March. Headers - Headers can be marked in several ways. Text in #Single Hashes# will be interpreted like an `<h1>` HTML tag (a big header). Text in ##Double Hashes## will be interpreted like an `<h2>` HTML tag (a smaller header). 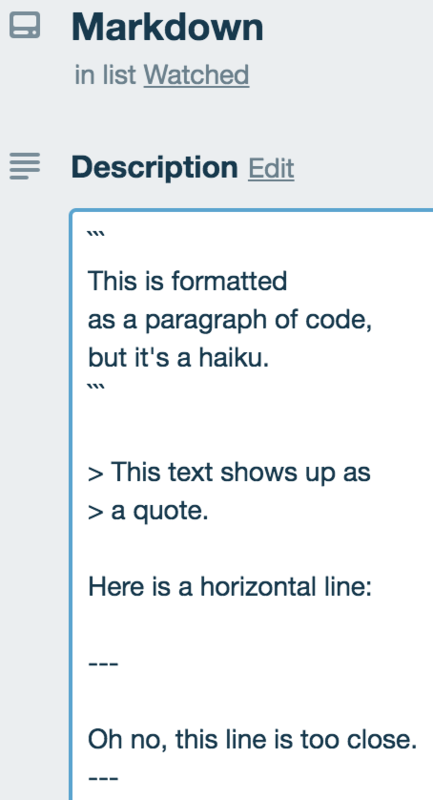 In headers, a line of hyphens below text will also be interpreted as an `<h2>` tag. 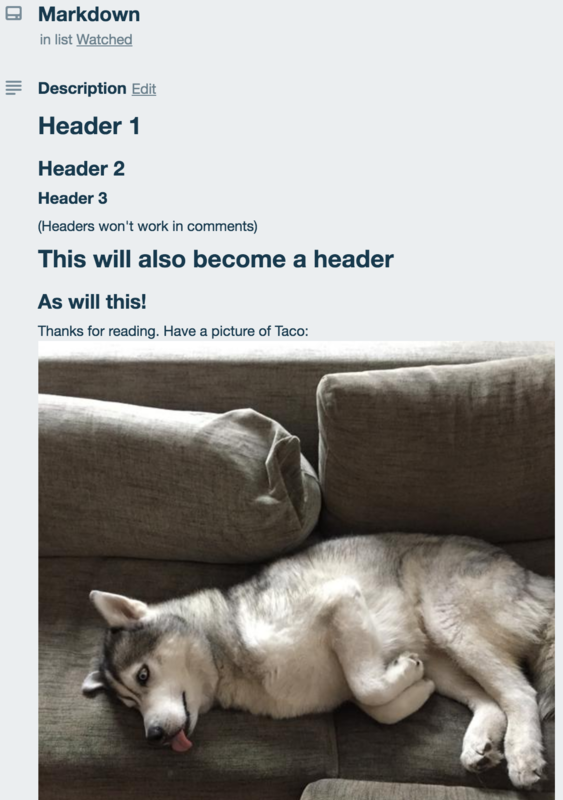 Embedded images - Embed an image by putting the link text in brackets and the image URL or path in parentheses, prefaced with an exclamation mark, like: ! [Alt text](/path/to/img.jpg). Escaping Markdown - To use the markdown syntax literally, you can escape the formatting using a backslash '\' before the symbols, e.g. \*literal asterisks\*. 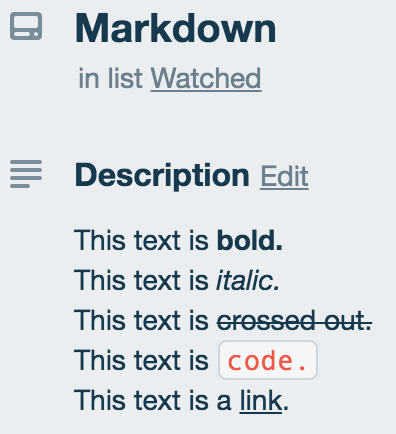 This is all the Markdown syntax that's available in Trello, but if you'd like to learn more about Markdown in general, you can see the complete syntax at Daring Fireball.